RZR Aluminum "RALLY" Style Top (2015-17 RZR 900, 2016-17 RZR 1000-S and 2014-17 RZR XP1K) Fits: 2015-17 RZR 900, 2016-17 RZR 1000-S and 2014-2017 RZR XP1K Laser Cut and CNC Formed to insure a perfect fit. Made from nearly 1/8” thick 5052 Aircraft Aluminum. Includes: LED Dome light and Aluminum housing. Hemmed sides make a smooth edge. Covers shoulder unlike others on the market. One-Piece Design. Powder Coated: Texture Black (Orange, Blue, Red and White Available, special order only call to order). 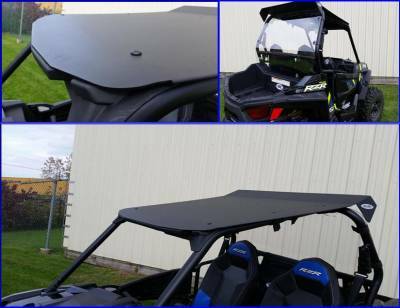 Protect yourself and the passenger from Rain and Sun with this “Rally” style aluminum top. It is fabricated from nearly 1/8” thick Aircraft Grade Aluminum. The LED Dome light runs up to 100 hours on the batteries provided. The top extends to the sides to protect your shoulders from rain. Installs in minutes with Rubber Coated Straps and hardware provided. NOTE: we ship an extra rubber coated strap that can be used on the rear tube. We do not pre-drill the hole because it could interfere with other accessories. We reserve the right to make modifications/improvements to our products at any time. Vehicles may have changes throughout the year. Therefore, pictures are a representation of the product you will be getting but may vary due to product revisions. If you want ORANGE please, make a note when checking out. If not we will assume you want texture black and will ship a black one.